This is drawing worksheet that can be completed in pairs or individually. 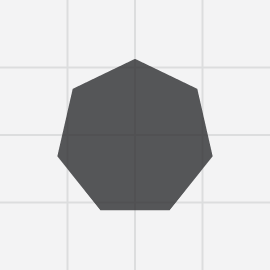 Learn about coordinates, shapes and functions by interpreting PaperScript instructions into shapes. To access the code in this library, you call a function... meaning you write the name of the shape and then add some numbers to draw it. For example, Rectangle(0,0,3,5) goes and finds the drawing instructions for the function Rectangle and uses the numbers in the brackets, called parameters to draw the shape. This example would draw a 3 by 5 rectangle at the top-left of your screen, if you were in Drawing Flags - JS103 or Flags Challenge - JS112. 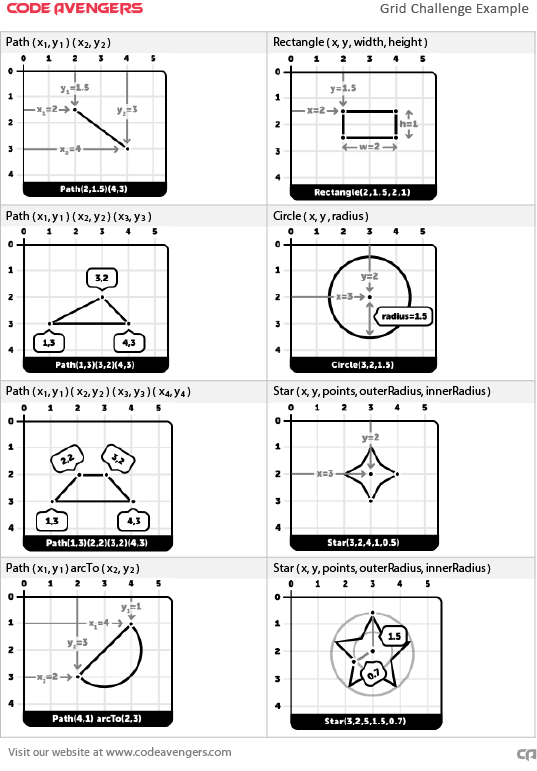 This printable reference pdf reminds you of the parameters when drawing 2d shapes on a computer (or by hand) using PaperScript shape functions. Regular shapes can be drawn in a systematic way, because of this we can create functions that will draw shapes for us, we just have to enter the values for the shape in a specific order. 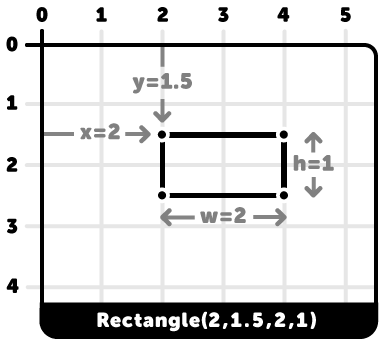 Rectangle(x,y,width,height) will draw a rectangle. The first two numbers are the coordinates for the starting point of the shape, the top left corner of the rectangle will be at this point. 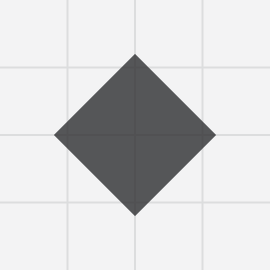 The width of the rectangle is counted across in pixels. The height of the rectangle is counted down in pixels. 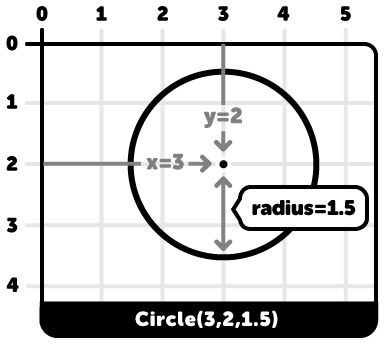 Circle(x,y,radius) will draw a circle. The circles' coordinates set the center of the circle, not the top left like the rectangle. The radius is then drawn from that point. 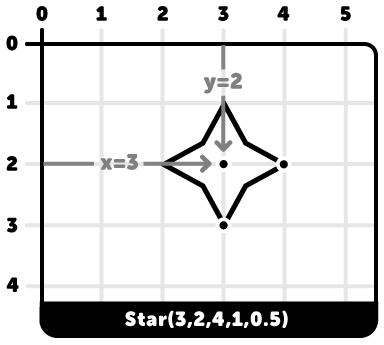 Star(x,y,points,outerRadius,innerRadius) will draw a star. Stars are fun, and a little tricky. Imagine we are drawing 2 circles and connecting them with a number of zigzag of lines. The computer then draws lines between each point of the 2 circles in a zig zag. The outer and inner radii can be adjusted to make some pretty cool shapes. Play around with all the different values and see what fantastic shapes you can create! Paths can make any shape, you simply have to give the coordinates of each point and it join them all together. 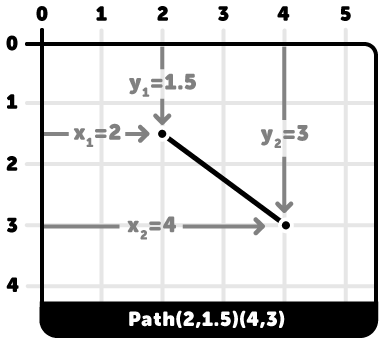 Path(x,y)(x,y)(x,y) for three different points will draw a triangle. As with all coordinates, the first number is across from the top left of the screen and the second number is down from the top left of the screen. 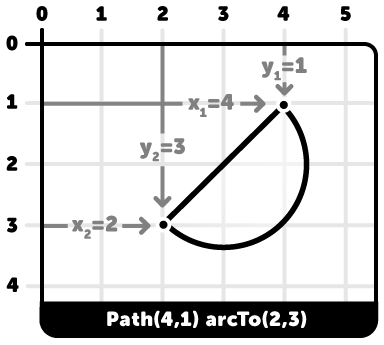 Semi-circles use the keyword arcTo between the coordinates of a line. This adds a curve between the two points as well as a line. 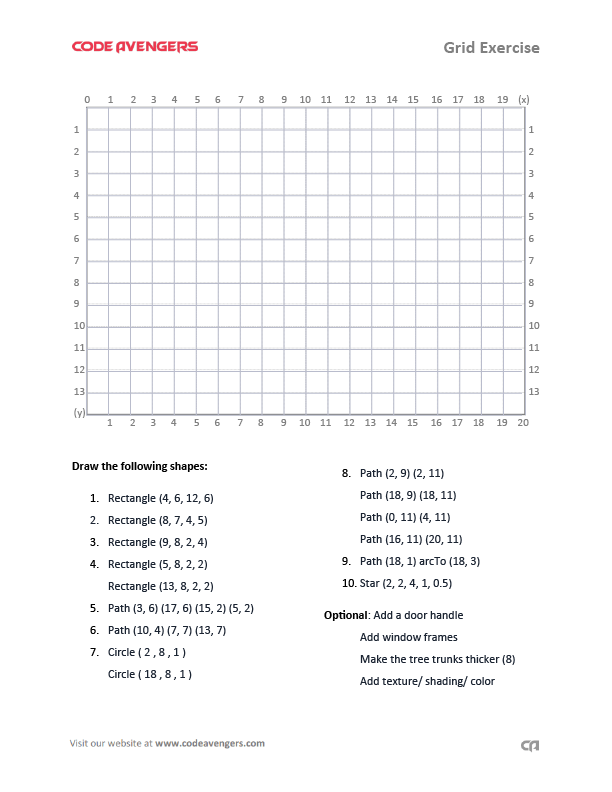 Print off the blank "Grid Exercise" worksheet and the "Grid Challenge Example" sheet below, which is a cheat-sheet of the shape functions and their parameters. 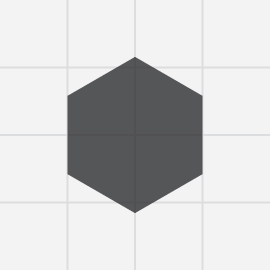 In this activity you draw a scene by completing 10 shapes. These ten shapes are written in as functions. 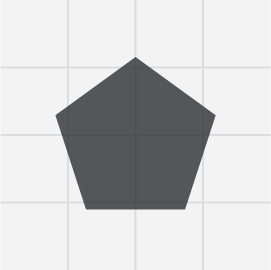 Intepret the size and location of the shape using the "Grid Challenge Example shape reference pdf"
Easy: Let learners constantly refer to the answer image as they draw. Medium: Tell the learners what they are drawing or show them the answer image before they begin. Hard: Give out the two pages and show the first steps but do not let them see the final image. 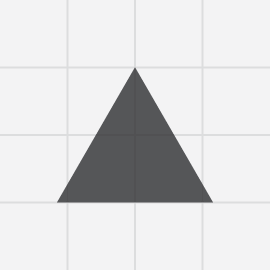 "For Shape 1, the function is a rectangle. we go across to line 4 and then ''down''' to line 6 and add a mark where (4, 6) meet. The rectangle is 12 squares wide so count 12 across and add a mark to (16, 6). The rectangle is 6 squares high so count 6 squares ''down''' and add a mark at (16, 12). Rectangles are equal in height and equal in width, so mark (4, 12) as well. Connect the dots to form a rectangle." For Shape 5, we are also drawing a four-sided shape but because the shape is not "equal in height and equal in width" it is not a regular rectangle. The Example sheet tells us that we must use paths of for irregular shapes. (3, 6)... Go across the grid to number 3, then go down the number 6. Make a mark where those lines meet. (17, 6)... Go across the grid to number 17, then go down the number 6. Make a mark where those lines meet. Rule a line between the two points. (15, 2)... Go across the grid to number 15, then go down the number 2. Make a mark where those lines meet. 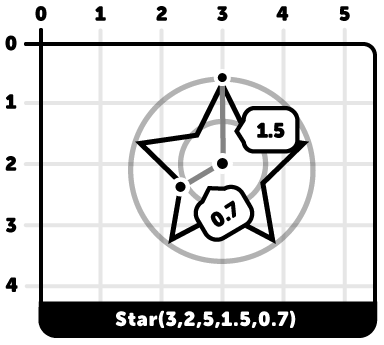 Rule a line between the two points, (17, 6) and (15, 2). (5, 2)... Go across the grid to number 5, then go down the number 2. Make a mark where those lines meet. 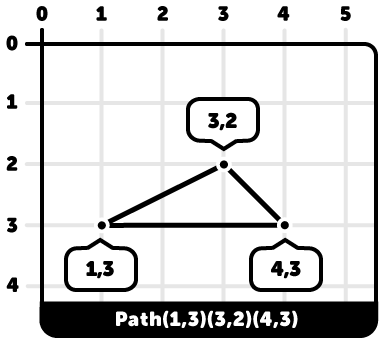 Rule a line between the two points, (15, 2) and (5, 2). 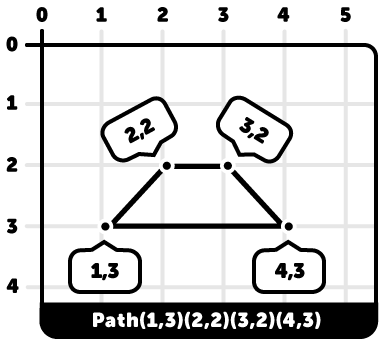 Rule a line between the two points, (5, 2) and (3, 6). An I.D.E is a place where you can write, save and run your own code and see the output. You can deploy your own apps, websites and games and also share your code with others. And it is all online, in the cloud! This makes it much easier to access and share your projects from anywhere.